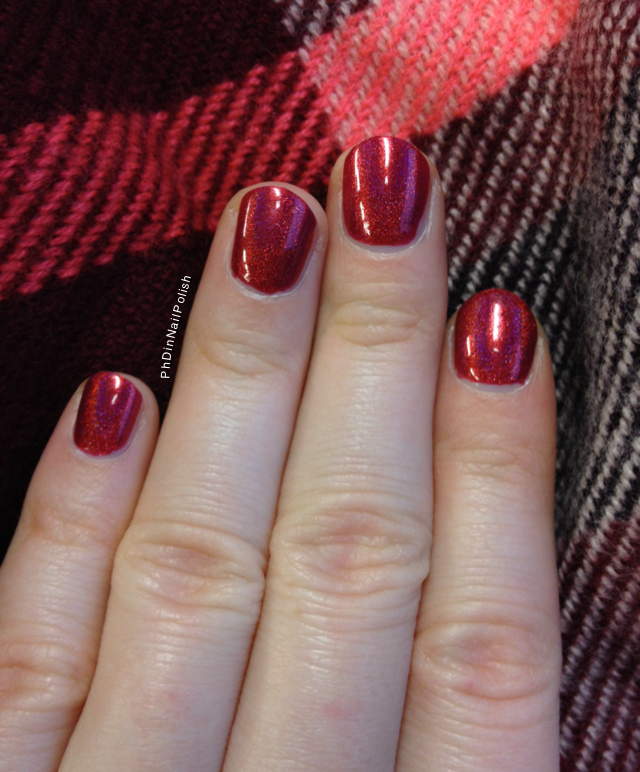 Today I’ve got “Man in the Red Suit”, a shade from Llarowe’s Xmas/Hanukkah collection. 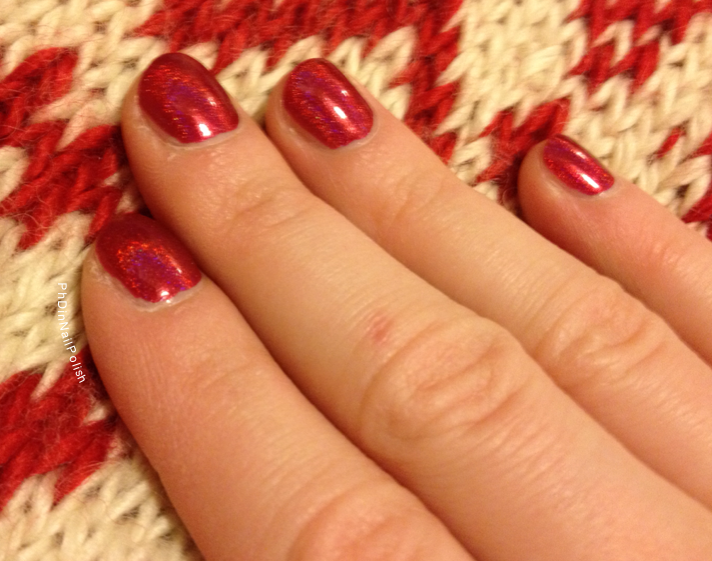 It is a bright red holo, which on my pale skin appears more on the raspberry side. The formula is nice and opaque- it also is a little less thick than other Colors by Llarowe polishes that I have, which I liked. It was easy to use, and I like the new, slightly larger and flatter brushes. I used two coats, with HK Girl as the top coat. The holo in this is really good, although not quite at “Dirty Diana” levels. I wore this polish for about a week, and it didn’t chip or fade at all, and removal was easy (no staining). You can find this color at the Llarowe website, but I am not sure if it will go back on sale in January before retiring. There’s still a possibility that it will go into the core collection under a different name. 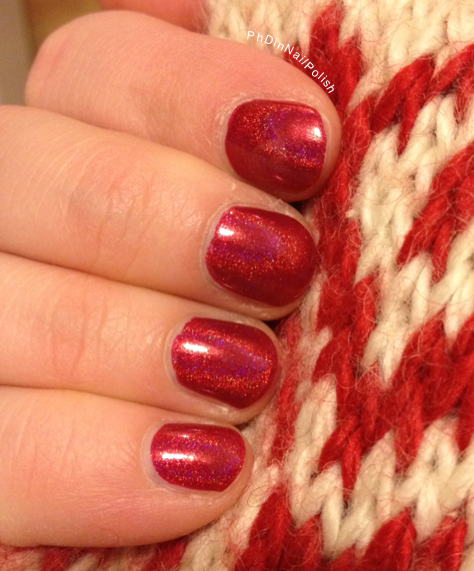 If you’re dying for a red holo right now, I’d suggest I Love Nail Polish’s “Very Ornamental”. 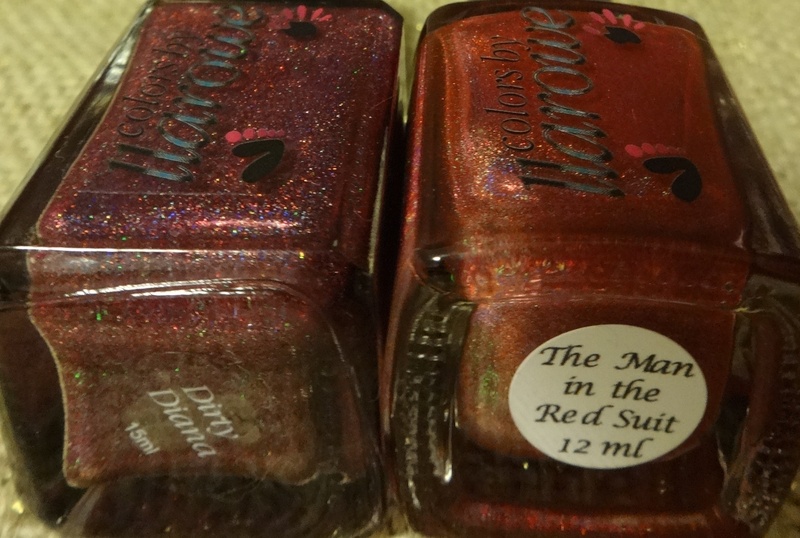 In case you’re curious about the color, I took a bottle shot of “Man in the Red Suit” alongside “Dirty Diana”. You can see that “Dirty Diana” is much more purple/magenta than “Man in the Red Suit”, and that the quality of the holo rainbow is a little different.